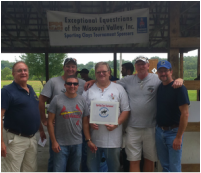 Events - Exceptional Equestrians of the Missouri Valley, Inc. Exceptional Equestrians holds several events throughout the year. Registration forms, photos and other event information can be found on this page. This year's Ride-A-Thon will be held on April 13th in conjunction with our Volunteer Appreciation BBQ. Ride-A-Thon is a great event that allows our clients to go out and find sponsors to support them on a fun trail ride. Thanks to everyone who contributed to this year's Wine, Dine and Whinny! Mark your calenders for Wine, Dine and Whinny 2019, which will take place on June 15th. See photos of this year's event HERE. Thanks to everyone who attended and sponsored this year's Sporting Clays Tournament! !